Humans are composed of at least 80% water. It affects every internal organ, and is the fluid that keeps our lives, and life itself, running smoothly. Even in the driest countries of the world, across the Middle East for instance, there is evidence of water everywhere - in clouds, and as precipitation, and as daily morning dew. This is in spite of a growing shortage of drinking water. Scientists are now able to successfully transform satiated water, which is water taken from the sea, filter it, and use it as drinking water for centres of population. Only 2% of the World's water is fresh: the remainder is salty, so breakthroughs in desalination are crucial to human survival. It is fair to say that there is more ocean on earth than there is landmass. In fact, water covers 71% of the Earth's surface. This amounts to 140 million square miles. The largest ocean is the Pacific, which covers a total of 69,375,000 square miles. The largest sea is the South China Sea, which covers 1,351,000 square miles. 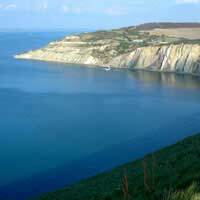 The largest lake in the world, which is so vast it is called a sea, is the Caspian Sea, with a size of 143,244 square miles. The lowest point on dry land is also a sea; Israel & Jordan's Dead Sea, which is 418 metres below sea level. It is called a 'dead' sea because the salinity and minerals in the water, which are harvested to make skincare products, cannot support life, and no aquatic creatures could live within its waters. Seas and Oceans across the rest of the world do support an astonishing variety of life, from plankton and corals, to a huge range of fish species through to dolphins, sharks, and whale varieties. Whales are the largest mammal species on earth, but some scientists believe that because the oceans are so deep and vast, there could be larger species that humans haven't encountered yet. The world's oceans and their health are now a very hot topic. We are aware of the problem of over-fishing, which is affecting every Country in the world with an active fishing Industry. When certain fish species are over-fished and either made extinct, or removed from the chain for a season (breeding can bring stocks up again to a certain level, if the species is left alone enough to do so), as well as humans having to alter our diet and change to another fish species, so too must other species in the food chain. This has far-reaching effects, and Governments and the fishing Industry worldwide are only now starting to work on this. Of far greater short and long-term damage, for us, for aquatic species, and for the survival of the oceans themselves, are the vast amounts of contaminants and pollutants that are being dumped into the oceans and seas on a daily basis. Some of this is not deliberate: wind, and run-off from rivers contribute to this poisonous process. But every oil spill and every plastic bottle discarded from a ship or tanker has an effect somewhere along the eco-system. Plastic is eventually broken down into what scientists call 'Angel's Tears' or tiny, tiny shards, which will release their chemical properties, and probably clog up the insides of one of the species to whom the oceans are home.